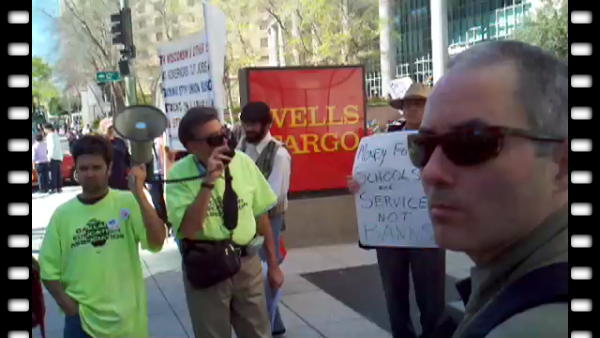 On April 4th, Oakland teachers and their supporters blocked the doors to the Wells Fargo branch at 12th & Broadway for over two hours while various speakers addressed the issues educators in Oakland find themselves confronting. Members of the ILWU Locals 10 and 34 were present in support and announced that they had shut down the ports in Oakland and San Francisco in solidarity with the "We Are One" national day of action. 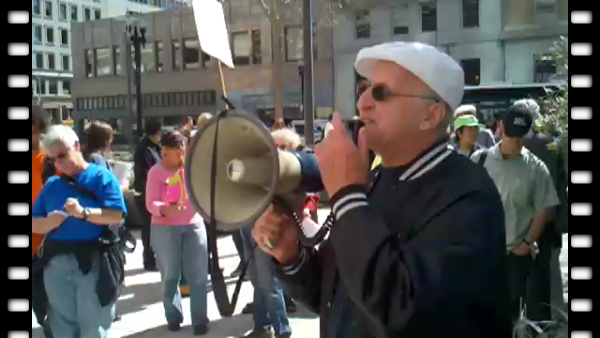 In the first video here, Bob Mandel of the Oakland Education Association (OEA) initiates the Wells Fargo action by quoting Martin Luther King Jr: "The purpose of our direct-action program is to create a situation so crisis-packed that it will inevitably open the door to negotiation." Before the action, he announces that Wells Fargo will be holding its annual shareholders' meeting on May 3rd in San Francisco where non-violent civil disobedience with arrests is expected. Betty Olson-Jones, OEA President, discusses previous attempts by the union to meet with Wells Fargo executives, only to be denied. She announces that the California Teachers' Association (CTA) is making plans for a week of action from May 9th - 13th with rallies around the state and an occupation of the state capital building in Sacramento to demand more than just "crumbs" for education but that the entire funding structure in California be changed. Jack Gerson explains the history of the big banks' increasing greed, their role in the 2008 national financial collapse, the trillions of dollars in bailouts the banks have been given, and he details the situation Oakland schools face after a recent state takeover in which the district's debts were tripled while schools were closed and are now looking at the possibility of the layoffs of over 600 teachers and educational support staff. 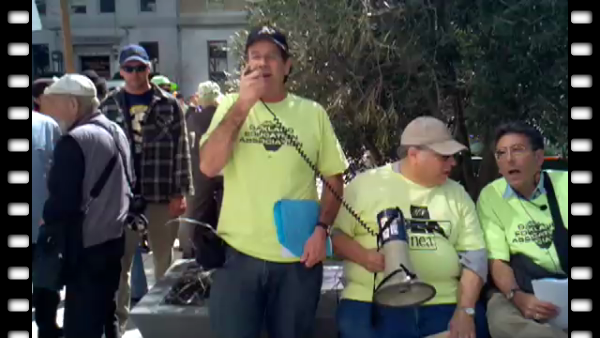 Update since this video was taken: The ILWU is being sued by PMA (Pacific Maritime Association) for the work stoppage that day and is currently organizing to fight back on a broad scale, with the first meeting on April 14th: http://www.indybay.org/newsitems/2011/04/12/18676930.php. The last general strike in the U.S. was in Oakland in 1946, started just a few blocks from this Wells Fargo action, and was initiated by transit workers. Craig Gordon, by reading a few quotes, makes plain how the legacy of Martin Luther King Jr. goes far beyond his "I have a dream" speech. MLK was becoming increasingly threatening to the powers that be as he spoke out against racism, economic exploitation, and militarism. "You really can't get rid of one without getting rid of the others. The whole structure of American life must be changed." MLK noted that after centuries of oppression, the civil rights legislation of the 1960s was just the beginning of what needed to be done.